Since February, the Syrian regime has been escalating its attacks on northwest Syria, joined by its ally Russia in Moscow’s first major assault on the region in months. A combination of airstrikes, artillery shelling and cluster munitions have killed 146 people and wounded hundreds more. In the first 18 days of March, 72 people died. The violence is in clear violation of the Idlib demilitarised zone, agreed to by Russia and Turkey in September last year. The zone was supposed to separate the regime and extremist groups and ensure the 3 million civilians in the northwest remained safe. Instead, many are now fearing for their lives. 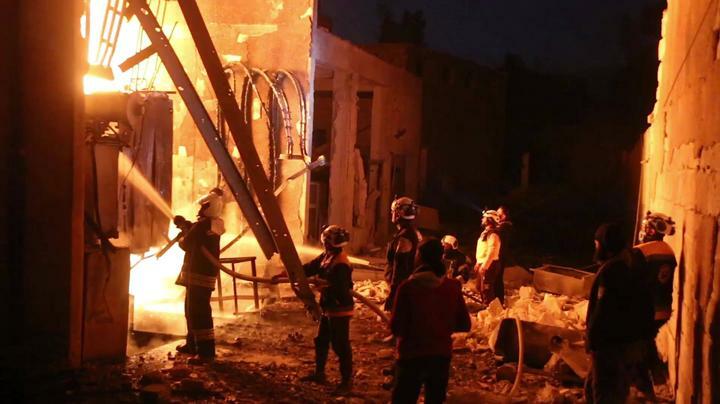 On 12 March, the regime dropped incendiary weapons on the town of al-Tamanah in southern Idlib, despite these being prohibited under international law. Warplanes, allegedly Russian, also struck a displacement camp outside the town of Saraqeb overnight on 12 March. The attack killed two women and injured dozens, most of them children. In defiance of international protections for civilians and civilian infrastructure, the regime has bombed homes and hospitals, including a maternity clinic whose staff had to evacuate 12 babies reliant on incubators. Raed Al Saleh, the head of the Syrian search and rescue organisation the White Helmets, has warned that the regime often bombs hospitals before a big attack so that the injured have nowhere to do. Since February, tens of thousands of people have fled their homes for overcrowded villages and IDP camps close to the Turkish border where they believe they’ll be safer. Many lack access to adequate food, water and medicine and are living in desperate conditions. It is not yet clear whether the regime and Russia are attempting to retake control of the whole region, or are attacking for some other reason; analysts have suggested that the two allies might have the more limited goal of retaking territory around the borders of the demilitarised zone, which would give them control over important roads to Damascus, Aleppo and Latakia. For now, military control of Idlib remains in the hands of the extremist group Hayat Tahrir al Sham (HTS), as well as other armed groups. The 3 million civilians in the region largely oppose HTS, but also fear takeover by the regime. Around half of the people in the northwest are displaced Syrians who fled regime cruelties elsewhere in the country and do not want to live under its oppressive control. An all-out assault by the regime is also likely to result in a devastating humanitarian catastrophe; the UN Secretary-General Antonio Guterres has previously warned that it could “unleash a humanitarian nightmare unlike any seen in the blood-soaked Syrian conflict”. Idlib’s civilian population is now waiting to see if the regime and Russia’s attacks will continue, or escalate into something even worse.